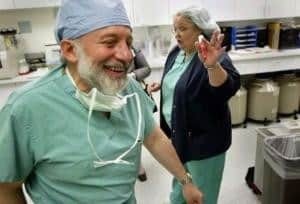 News of the world’s first baby born after a remarkable ovary transplant operation offered hope last night to millions of women around the world with fertility problems, including more than 100,000 women in the UK who suffer from early menopause and those undergoing chemotherapy or radiotherapy for cancer. The birth of Maja was described by mother Susanne Butscher as “a little miracle”. The 39-year-old was given the ovary by her twin sister, Dorothee, a year ago, after she suffered an early menopause. Mrs. Butscher had been diagnosed as being infertile 12 years ago and was told her ovaries were not working properly. The success of the technique will offer hope to infertile women – particularly those with cancer who could otherwise be left infertile by their treatment. They will be able to have their ovaries removed and frozen until they can be put back at a later date. But the overwhelming usage will be by women who want to preserve their fertility for the future and delay the menopause, Dr. Silber said.